At each American Foot & Leg Product Store we offer these outstanding foot care products to provide each patient with the relief they expect when they trust their foot issues to our highly trained and committed staff. Steri Shoe: Steri Shoe is a patented shoe sanitizer that uses germicidal ultraviolet light (UVC) to sanitize the inside of shoes. Steri Shoe safely and effectively kills 99.9% of the bacteria, fungi, and spores in shoes that cause athlete’s foot, toenail fungus, and shoe odor. For people with diabetic foot problems, Steri Shoe can guard against infection. Fungi Foam: FungiFoam® Antifungal successfully treats Athlete’s Foot and Ringworm while providing the benefits of four other products: formulated with oil-soluble tolnaftate in natural jojoba oil; calms the itch; moisturizes; and exfoliates. Apply directly to wet skin immediately after drying to seal pores. Clean Sweep Spray: This spray utilizes a nanosilver formula to provide a clear and flexible antimicrobial micro-coating to safely kill bacteria and neutralize the causes of shoe odor. It creates a “shield” which maintains microbe-free footwear. Macer RX: A new fast drying gel for deteriorated, infected web spaces between toes due to fungal yeast infection, bacterial infection, and ringworm. Relieves symptoms of itching, burning, and cracking of the infected area. 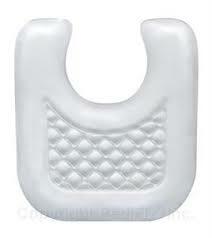 Corn Pads: Gel corn protectors cushion and protect while they help soften and moisturize stubborn corns. Toe Caps: Toe Caps protect toes from blisters, rubbing, irritation and toenail loss. They serve as a cushion, preventing a single or multiple toes from direct contact with the inside of the shoe. Soft white plastic absorbs stress to toe area. Cut to fit. Bunion Cushion: Eases pain from bunions with a soft, comforting gel held on with a toe loop. It also cushions calluses and hard skin to ease painful shoe pressure and friction. 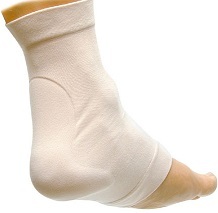 Wear over bunion or tailor’s bunion inside sock. Toe Separator: Intended to reduce friction and irritation between toes that are in an awkward or uncomfortable position. The white hourglass soft plastic device carefully pulls the toes into a position where they do not touch or overlap. Hammer Toe Corrector: The Hammer Toe Corrector is flesh colored fabric which comes either as a single or double toe straightener. It holds adjacent hammertoes or crooked toes in the correct position with loops over the 2nd and/or 3rd toe. Hammer Toe Gel Pad (Crest Pad): A Hammer Toe Gel Crest Pad is an adjustable fabric covered gel pad which provides cushioning and support for bent-under toes and sensitive toe tips. Worn under the toes, it also relieves both forefoot and ball of foot pain and stress on hammer, claw, mallet, arthritic and bent-under toes, as well as pressure on toe-tip corns. Thera-Band – a latex resistance band used for physical therapy and light strength training exercise and to strengthen and stretch the feet. Foot Roller – used to provide temporary relief from pain associated with plantar fasciitis, heel spurs and tired feet. The roller stretches the plantar fascia and increases flexibility.Can be chilled to help reduce inflammation. Bio-Freeze – provides temporary relief from minor aches and pains. Achilles Heel Pad: Flesh colored fabric over gel pad. Place over Achilles Heel area. Gel Heel Sleeve: White tube sock with blue gel pad zone on heel which protects dry, cracked heels from friction and pressure. Formula 3: Tolnaftate in a jojoba medium, brushed on nails twice daily for the treatment of athlete’s foot and ringworm. Dr.’s Remedy Enriched Nail Polish Collection and Treatments: Nail polishes with anti-fungal properties from natural tea tree oil and other natural ingredients. Over 30 colors to choose from, as well as nail care products including top coat, base coat, and cuticle serum. Formaldehyde and toluene free. Amerigel Lotion: Non-oily lotion with quick-absorbing blend of ingredients to soften and exfoliate corns and calluses while moisturizing. Massage directly into skin in morning, and repeat applications as necessary. Metatarsal Gel Pad: Gel metatarsal pads on adhesive fabric are positioned in shoes where the ball of the foot rests to treat forefoot pain. 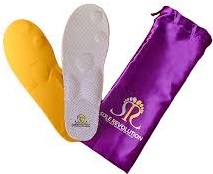 Gel pad is easily hidden in shoes such as sandals. Flat Gel Metatarsal Cushion: Fabric with gel cushion inside and toe strap helps relieve pain on the ball of the foot. Metatarsal strap wraps around forefoot to provide superior cushioning on affected area. Gel Callus Cushion: White opaque gel pad to position around sore or affected callus to protect from friction and provide cushioning from shoe. Calicylic Cream: Contains Salicytic Acid to aid in exfoliation and softening of dry, scaly or calloused skin. Cavilon Cream: A unique moisturizing barrier cream formulated with 3M polymers for patients with severe dry skin and to protect wounds or sores on feet and legs. 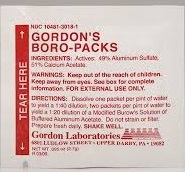 Gordon’s Boro-Packs: Individual packets of a mild astringent which relieves irritated skin due to itching, insect bites, rashes and poison ivy. Dissolve one packet in a pint of water. Soak one or two times daily. Biofreeze: Analgesic cream that provides temporary relief from minor aches and pain. Compression Socks: Knee high legwear used to help increase circulation, prevent the formation of blood clots in the lower legs, and aid in the treatment of ulcers of the lower legs. Recommended for patients with diabetes and edema. Revolution Orthotics: Designed to fit in both regular and sports shoes, the purpose of the arches is to provide stability while standing, and to absorb stress when walking, running and jumping – similar to a shock absorber for feet. Redi-Thotics: Redi-Thotics gel socks are designed to maximize your performance and increase comfort. Each unique Redi-Thotic offers relief to foot ailments relieving pain and discomfort. Power Step Orthotics: Powerstep orthotics combine balance, support, and cushioning to relieve foot pain. Slim design fits heels and open toed shoes. Heel Lifts: Cushioned formed pad to place in heel area of shoe to provide relief from heel spurs and plantar fasciitis. NeuRx: Oral supplement for nerve function support, combining powerful antioxidants that help protect nerve cells from oxidative damage related to aging and environmental stress. In addition to promoting nerve heath, this supplement may help maintain healthy blood sugar levels. Recommended for patients with diabetic peripheral neuropathy. 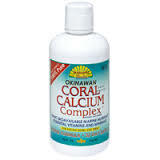 Coral Calcium Complex: Supplement is a natural source for strong, healthy bones. Features recommended 2:1 ratio of calcium to magnesium. Take one capsule 3 times a day. 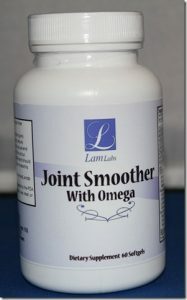 Joint Smoother w/Omega: Combined glucosamine, chondroitin and Omega 3 formula to reduce inflammation, support cartilage growth, and help cushion joints. 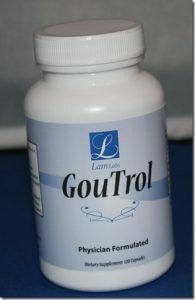 GouTrol: A botanical dietary supplement specifically formulated to support normal tissue metabolism in and around the muscles and joints. Effective in reducing the symptoms of gout – contains herbs with diuretic and anti-swelling action that facilitate the removal of uric acid. 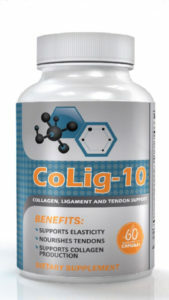 CoLig-10: CoLig-10 is a high potency combination of nutrients which supports ligaments and tendons. Included is collagen, the main protein found in connective tissue (which helps structurally form ligaments and tendons). Amerigel Post Op Kit: Convenient 30 day post-op wound care supplies includes a 1-oz tube of AmeriGel® Wound Dressing, a 4-oz. AmeriGel® Wound Wash, 30 fabric bandages and 30 dry gauze pads for once a day dressing changes. Pre/Post Op Scrub: A broad-spectrum, topical microbicide for degerming, pre–operative skin preparation or post–operative care. Formadon Rx and Forma-Ray Rx: Formadon is a 10% Formalin solution used as a drying agent for plantar warts. 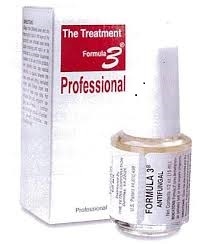 Forma-Ray is a 20% Formalin solution used as a drying agent for postsurgical removal of plantar warts or for nonsurgical laser treatment of warts. Aetrex and Dr. Jill’s Gels: Here is a picture of our actual product store! The Dr. Jill’s Gels products include hammer toe pads, gel toe caps, gel corn pads, gel bunion cushions, gel toe separators, and metatarsal cushions. 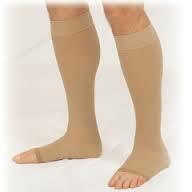 The Aetrex products include anti-fungal socks and compression socks. Stop by one of our product stores at one of our four convenient locations today!